Michelina DiCiurcio first appears in the Painesville, Ohio, area in 1929. 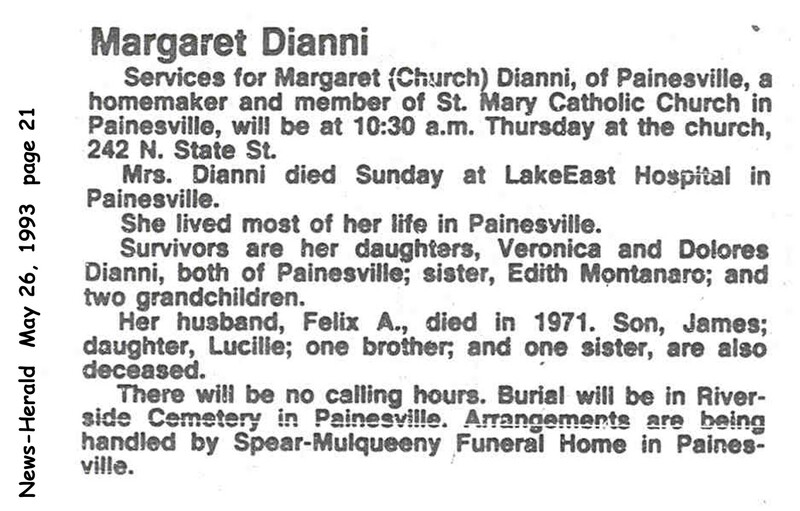 In America, Michelina DiCiurcio was known as Margaret Church, then after she married, by her married name Margaret Dianni. Michelina DiCiurcio, daughter of Giovanni DiCiurcio and Lucia Mancini, was born on April 19, 1902, at Isernia, Italy. She married Felice DiIanni, son of Gennaro DiIanni and Filomena Incoronata Venditto, on April 6, 1929 at Mt. Carmel Catholic Church, Ashtabula, Ashtabula County, Ohio. Michelina died on May 23, 1993, at LakeEast Hospital, Painesville, Lake County, Ohio, at age 91. Her body was interred at Riverside Cemetery at Painesville, Lake County, Ohio. Michelina DiCiurcio immigrated to the United States on February 26, 1904. She became a citizen of the United States on March 8, 1931. Margaret resided at Painesville Township, Lake County, Ohio, when she was naturalized.